We are back from the show that took place in Miami USA last week. It was a great event, the biggest in VoIP industry. More info about numbers of visitors and exhibitors can be found at www.itexpo.com It was very exciting to see all the market leaders in one place though we were so busy at our stand that hardly had time to walk around. The impression after the show is very positive. 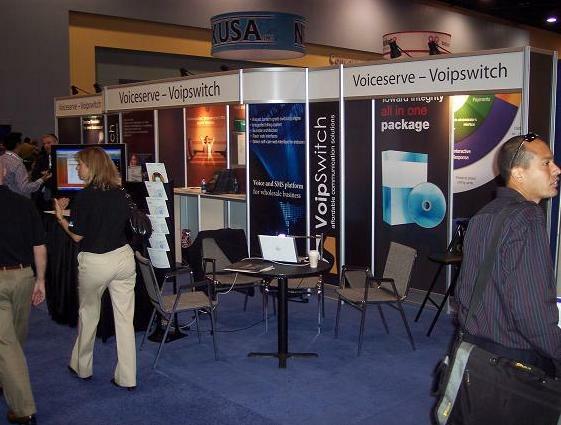 In spite of all what he hear about slowdown in the global economy it looks like VoIP is an exception. We had more than 100 meetings, lots of new contacts and we look forward to increase our customers base especially in Americas. Definitely we will be exhibiting also at the next ITEXPO in Los Angeles in october 2009. Below are some more pictures of our stand and our staff busy with visitors. Opposite to our stand was APB Tech – our reseller from US. We met also with our friend and reseller from Mexico, Miguel Bazan, CEO of Intelivoip. Unforgettable experience was a trip on a fast boat with our old friend from Aventura-Networks INC from Miami, Craig Waltzer. I would like also to thank all our customers that visited us. it was an occassion to meet in person with our old, good customers that untill the show we had known only online.